Oster TSSTTVPZDS Convection Oven Review is going to talk about all teh features of this pizza oven and how it is really useful when it comes to cooking a pizza. This oven can be used for other functions as well and hence it is multi-functional and comes with a really good price feature balance. 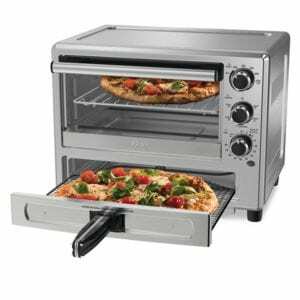 If there was one oven that I would say works really well as a convection oven and a specialized pizza maker then it has to be this one from Oster. The oven has a dedicated pizza drawer which you can dedicate to cooking pizzas with ease. So, without wasting any more time, let’s get into the features of this pizza oven. 1. This oven from Oster comes with two compartments in which one of them can be used for the regular cooking and the other one is the pizza drawer, now this makes it special. The dedicated pizza drawer can be used to cook pizzas up to 12 inches and it provides with the perfect requirements that would be needed in order to cook the perfect pizza. 2. The special pizza drawer can even be used to cook bruschetta and quesadillas. Basically, the pizza drawer can be used to bake anything that is similar to a pizza and needs the same style of cooking. The drawer is pretty handy as you do not need to dirty the top compartment, however, you cannot use the top compartment and the pizza drawer simultaneously. 3. This pizza oven is really versatile, hence you can make a good number of dishes using the functions ranging from Warm, Toast, Bake and Broil. This convection oven circulates hot air which results in even cooking and really great results. The oven has settings as mentioned above that can be used to set the oven and bake different types of dishes and recipes. 4. You can easily cook a whole chicken, casserole and bake other snacks without worrying that the oven is going to be small and won’t be able to fit the huge dishes. The problem with an appliance that is exclusively a pizza maker like the Pizzazz Pizza Maker is that you cannot bake a whole chicken or any other item but while using such convection ovens, you can easily cook a variety of dishes and since it has a deep interior you won’t have to worry about it being too small. 5. The timer ranges from 0-60 minutes and the maximum temperature of the oven is 450-degree Fahrenheit. The temperature is perfect for baking pizzas and they usually need 450 degrees. This will ensure that you can bake for the exact time and temperature in the oven. 6. The insides of the oven are non-stick and it is pretty easy to clean up. Usually, cleaning an oven can be a task but since this one is non-stick, it is easier to remove any stains that might have occurred due to cooking different dishes inside the oven. So, the maintenance on this oven is going to be easy. 7. It takes less space on your counter (compared to other ovens) and you can easily place it in a corner. The dimensions are mentioned in the specifications for the exact measurement but they are an average sized oven and you can easily fit them on your counter. 8. The handle of the pizza drawer is insulated so you can easily pull out the pizza from the oven when it is done. 1. You cannot use the pizza drawer and the toaster oven compartment separately which is a bummer. Honestly, it would have been great if you could use them simultaneously as it would save a lot of time while cooking. At the price point of $100, this oven from Oster is probably the best multifunctional oven that you can use for making pizzas and baking/cooking other dishes and recipes.One of the best part about this oven is that it is compact and can be easily cleaned which leaves you with very little maintenance. The pizza drawer along with the combination of the toaster oven is probably the best for the price and if you are looking for an indoor countertop pizza oven then you should definitely check out this one on Amazon. The Oster Oven can last you long and has a good price feature balance. If you have used this pizza oven then do share your experiences in the comments section below! If you know a pizza lover who would appreciate this pizza maker then do share this post with them!